Anand Gope and Hiralal Mehto lead the Jharkhand Chapter of OSCAR. They are running a girls program in Ranchi, Jharkhand in a tribal village named Chari Hujir. More than 170 girls are associated with this OSCAR Program. Many girls want to join in the program. Only if they come for 3 months everyday will their names be registered. They don't earn money but they have to save a little of what they are given by their family members. The girls manage to save Rs. 10 every week out of the money they get to eat and attend school. Some girls go to school but some others don't. Girls who used to go to school never had good attendance, but after joining Oscar they have been going to school regularly. Every day, before practice they are questioned if they attended the school or not. We try to make the students understand why they should go to school. A good player is a good student. You can even get jobs if you study. Salo Kumari and Aarti Kumari never went to school. They used to work as labour since childhood, and after work they managed the work at home. But Salo used to come to play football against her mom's wish who never liked her playing Football. When asked as to why she wouldn't go to school, she said that her mother never allowed her to go to school. She wanted Salo to work. But, Salo always wanted to go to school. So, we went ahead to convince her mom about the importance of education. And today, Salo and Aarthi, both attend school. The kids said, "We could never believe that there will be a day when we will be allowed to go to school." There are many such kids who now go to school. We make the students study on Saturday and Sunday also. Parents are also happy now. They say, "My daughter never used to get up early, but after joining Oscar she wakes up early, finishes the work at home and plays football as well." After the Nagpur Championship Football Tournament, a parents meeting was organized and they were asked how they felt when they saw their girls participate in another state. They said that they were very proud of their kids. The girls came back as Runner up Winners. Parents never used to allow girls to play football saying that they wouldn't get jobs. But then, we explained that girls aren't any lesser than boys and they need a chance to prove themselves. Today, parents' thoughts have changed because of Oscar program. Girls were very shy earlier, but today, they have the boldness and courage to face anyone. - They need an English teacher for Oscar Football Players. - The ones who are not going to school have to be sent to school. - The ones who are going to school have to be sent to private school. - They want to Stop Human Trafficking. - They want to Stop Child Marriage. - They want to get in more opportunities for girls to participate in inter-state tournaments. One of the most pressing problems is Child Marriage. The girls get married at 14-15 years of age. Hemanti Kumari was a good football player. One fine day, she stopped attending football classes. When asked why, she said that her parents wanted her to get married. Kajal Kumari also faced a similar situation at her home, but then, Anand and Hiralal Mehto spoke to their parents and made them understand as to why it was necessary for girls to attend school and how they could become independent. 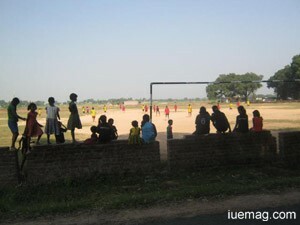 Today, both the kids are studying well and play Football as well. Soni Kumari was one of the few students who joined Oscar Program initially. She was a very good football player. After she completed her 10th standard she became a school teacher. Her life wasn't very easy. Her drunkard father used to scold her for all that she was doing. But, one fine day, Anand and Hiralal spoke to her father and made him understand. Today, she not just takes care of home but inspires many other girls who want to achieve something in their lives. She says, "I cannot imagine how bad my life would have been if Oscar hadn't come to my life." The Jharkhand Chapter has been taking up women empowerment through OSCAR programs at a very strong commitment level. In the near future, the entire nation shall witness the impact of their good work. IU eMagazine team feels privileged to have uncovered this cover story for its readers. We wish the entire team of Jharkhand chapter of OSCAR to continue the good work and inspire many more across the globe. Any facts, figures or references stated here are made by the author & don't reflect the endorsement of iU at all times unless otherwise drafted by official staff at iU. This article was first published here on 2nd October 2014.